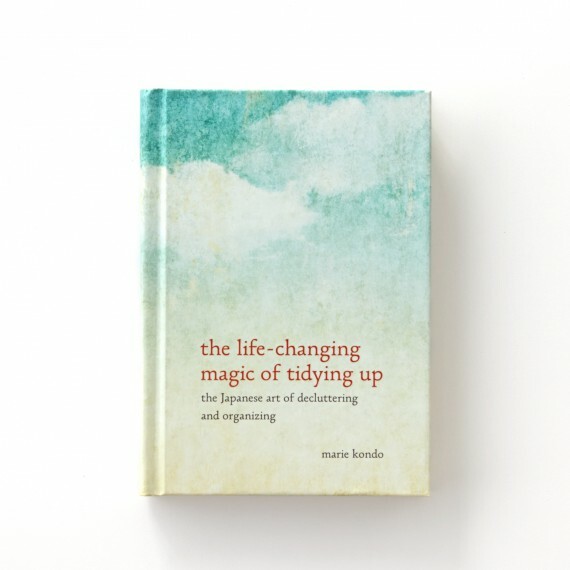 I jumped on the bandwagon and read “The Life Changing Magic of Tidying Up”. First, I unlock the door and announce to my house, “I’m home!” Picking up the pair of shoes I wore yesterday and left out in the entranceway, I say, “Thank you very much for your hard work, ” and put them away in the shoe cupboard. Then I take off the shoes I wore today and place them neatly in the entranceway. Heading to the kitchen, I put the kettle on and go to my bedroom. There I lay my handbag gently on the soft sheepskin rug and take off my outdoor clothes. I put my jacket and dress on a hanger, say, “Good job!” and hang them temporarily from the closet doorknob. I put my tights in a laundry basket that fits into the bottom right corner of my closet, open a drawer, select the clothes I feel like wearing inside, and get dressed. I greet the waist high potted plant by the window and stroke it’s leaves. Froufrou overload. I spent a great deal of time trying to keep my eyes from rolling to the back of my head. It started to go bad for me right in the first chapter when she talks about how once people start this life changing method of tidying – lives are completely changed. One person was so changed they even got a divorce. It’s not that I don’t think a divorce is ever necessary and it may have been the right thing for the person to do, I just don’t know that it should be a selling feature of your method. I was just so happy getting rid of all my extra stuff, I threw my husband out too! A nit-picky little disagreement I mentioned on instagram. No way that there isn’t going to be some wardrobe cycling in the standard sized closet of standard Wisconsinite couple. My biggest complaint was the permeating idea of affluence which probably makes sense when you think about the audience of home organization books, but was still overwhelming. I think it’s a little arrogant to assume that people can afford to surround themselves and clothe themselves only in things that “spark joy”. Ideal, perhaps, but also unlikely. Anyway, all of this to say, while I’m not crazy about all of the book there are definitely ideas worth incorporating (visualizing the life you want to live, organizing by type and not room, and doing it all in one sweep). I’ll fold clothes all fancy if it helps keep my t-shirts more organized and while I’ve never been one for keeping a bunch of mindless paperwork around, I’ll go through and toss out more (though some of the things she deems unnecessary, I use and will keep). So I’m spending some time thinking about what I want life to look like and how our family home can reflect that. Of all the things she speaks to, I think that is the one thing I will definitely be taking away from this book. It’s always a good idea to begin with the end in mind. Laughter aside, we could probably all do with a bit more of appreciation for the stuff we have in our lives (I’m working on a rambling post addressing this, but who knows if it’ll ever see the light of day…) although I’m not sure we need to anthropomorphize our belongings (and perhaps there would be less eye-rolling all around if Kondo didn’t do this). On another note, I finished All the Light … I LOVED it — the writing, the separate stories coalescing in the end. I know you said you were kind of “meh” about the end, but I thought it was probably the right kind of ending, if that makes sense. Very sad about Werner’s fate, but war is sad and senseless, and I think if the author had given him/them a happy ending (together?) it would have seemed contrived and a bit unbelievable. I loved what Werner did with the house and the stone … that he turned out to be one of the few people who would be able to (figuratively) throw 5 Eiffel Towers into the sea (was it 5? the book is now back at the library…). YES! She spends a lot of time talking about the energy of things which I could have stomached if it weren’t for the anthropomorphizing. Will be interested to read your post on the appreciation of things and your thoughts on “the life-changing magic…” when you get a chance to read it. As for “All the Light”, I definitely the agree the ending was appropriate. I think I felt so ‘eh’ because it continued on long after I felt things had resolved. I’m not quite sure why this book has become such a sensation. I found much of it to be useful (though I skimmed/fast-read a lot of it), but I don’t get why it’s such a huge best-seller. Maybe the kookiness of it? I don’t know, but in spite of its impracticality, I do love the focus on keeping what we love as opposed to just getting rid of things. I was about to buy some clothes from a summer clearance rack this week (because it was such a bargain! ), and I stopped when I realized I didn’t really love the things in my hand. I only wear/use the things I really do love. Does that mean I threw out everything that doesn’t meet that criteria? No. But this line of thought is definitely helping me as I acquire new things. Slowly because, yeah: Not made of money here. I do like her concepts on clothing. They echo the concepts of a capsule wardrobe which I heard of awhile ago and find fascinating. I haven’t actually purged my closet according to that criteria, but I have been more thoughtful of whether I really love something and whether it will work with what I already own. I think giving ourselves permission to let go of our mistakes is huge. HUGE. I feel so much better when I do!